This article is about the circle of latitude. For the border between North and South Korea, see Division of Korea and Korean Demilitarized Zone. The 38th parallel north is a circle of latitude that is 38 degrees north of the Earth's equatorial plane. It crosses Europe, the Mediterranean Sea, Asia, the Pacific Ocean, North America, and the Atlantic Ocean. 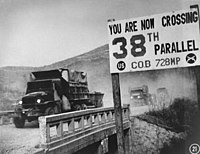 The 38th parallel north formed the border between North and South Korea prior to the Korean War. At this latitude the sun is visible for 14 hours, 48 minutes during the summer solstice and 9 hours, 32 minutes during the winter solstice. Japan had occupied the Korean peninsula between 1910 and 1945. When Japan surrendered in August 1945, the 38th parallel was established as the boundary between Soviet and American occupation zones. This parallel divided the Korean peninsula roughly in the middle. In 1948, this parallel became the boundary between the Democratic People's Republic of Korea (North Korea) and the Republic of Korea (South Korea), both of which claim to be the government of the whole of Korea. On 25 June 1950, after a series of cross-border raids and gunfire from both the Northern and the Southern sides, the North Korean Army crossed the parallel and invaded South Korea. This sparked a United Nations resolution against the aggression and the Korean War, with United Nations troops (mostly Americans) helping to defend South Korea. 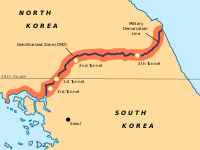 After the Armistice agreement was signed on July 27, 1953, a new line was established to separate North Korea and South Korea. This Military Demarcation Line is surrounded by a Demilitarized Zone. It crosses the 38th parallel, from the southwest to the northeast. The Demarcation Line is often confused with 38th parallel, but as can be seen in the image of the map, the two are not the same. ^ Nash, Gary B., The American People (6th edition), Pearson Longman (New York), 2008.